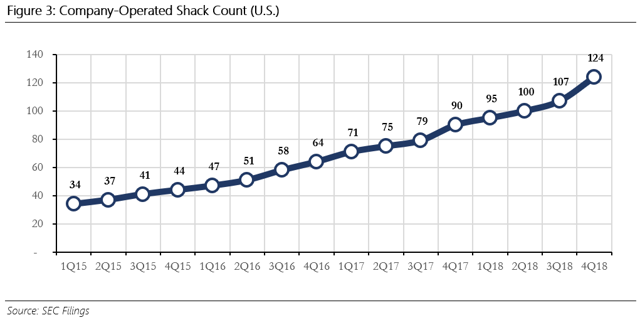 Shake Shack reported 124 company-operated Shacks in the U.S. in 4Q18, with the goal of reaching 200 Shacks by 2020; over the next decade, the runway for growth remains long. The firm boasts ~$87 million in cash & equivalents (~$3/share), alongside little debt, which gives management room to pursue growth strategies. Domestic company-operated Shacks boast an AUV of over $4 million, with a Shack-level operating margin of over 20%; with new store builds costing ~$2.2 million, cash-on-cash returns are impressive. When compared to Shack-level operating profit, the firm appears to be more than reasonably valued. 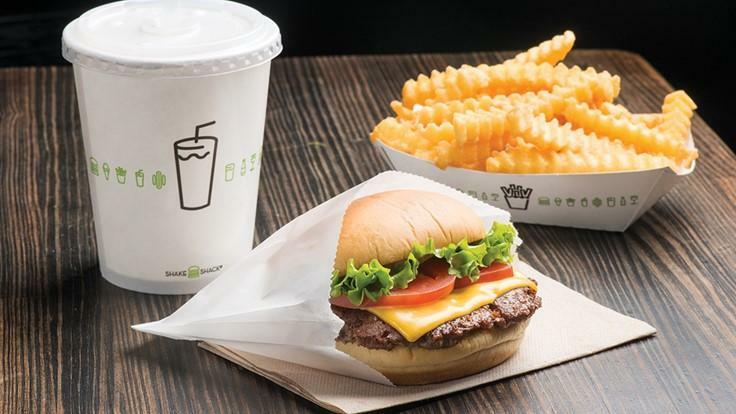 In our previous piece, we noted the many great features of Shake Shack’s (SHAK) business. However, we expressed concerns regarding just how fast they could grow over the next decade. After reevaluating out our analysis, our sentiment on the firm has shifted from skeptical to optimistic. Although risks remain, we believe the potential reward makes an investment more than worth it. We had previously acknowledged Shake Shack’s long runway for growth – a characteristic which makes the firm attractive for growth-oriented investors. With just ~124 company-operated Shacks in the U.S., the potential for store growth here is lucrative. We compared Shake Shack’s current store count to Chipotle’s (NYSE:CMG) total store count, arriving at a penetration rate of sorts. If Shake Shack could reach a store count of ~2,000 in the U.S., Shake Shack is at only ~6% of its full potential. This would not include unconventional store types (e.g., food trucks and airport-based locations). Chipotle’s store growth is also worth looking at. From the get-go, you can see that Chipotle was able to add a significant number of stores throughout the course of 15 years. The average number of stores added per year was 145 – considerably higher than Shake Shack. However, readers should recall that Chipotle had McDonald’s (MCD) backing the firm, helping them grow from 16 locations to nearly 600 (from 1998 to 2006). This allowed Chipotle to grow at a much higher rate in the earlier years. Shake Shack, on the other hand, is adding new stores organically. Shake Shack has opened an average of ~49 stores per year. Again, it’s important to reiterate that the growth has been organic. As a result, Shake Shack has been able to keep their balance sheet in a healthy state, with no debt and plenty of cash. As of 4Q18, the firm boasted a cash balance (including equivalents) of nearly $87 million (or nearly $3 per share). Going forward, the company can lever up which could help further drive store growth. Now, moving on to what we believe is one of the most attractive features of Shake Shack as a business: the unit economics. As we previously mentioned, the firm’s unit economics are quite impressive. Each domestic company-operated Shack generates over $4 million in revenue per year. Adjusting for pre-opening costs & depreciation, operating-level margins come in at over 20%. In the most recent quarter (4Q18), Shack-level operating margins were 22.5%. Of course, not only does this signify the strong profitability of company-operated Shacks nationwide - it lays the foundation for management to continue reinvesting capital at high rates of return. This is where many companies fail to grow considerably in the long run - they have great businesses, yet can't reinvest capital at a significant rate of return. Given that the cost of building a new (domestic) company-operated Shack averages $2.2 million (including furniture, fixtures, & equipment), the cash-on-cash return here is certainly attractive. Of course, as time goes on, we expect the firm’s average unit volume (“AUV”) to decline as more locations are constructed. This is natural and expected. At scale, management is aiming to obtain an AUV of ~$3 million, with a 20% Shack-level operating margin. Looking at the decade which lies ahead of Shake Shack, we believe it is likely that management will be able to add over 60 stores per year on average. This growth estimate is weighed into the latter half of the decade, as cash becomes more abundant. Should management seek to lever up (which would not be difficult, as previously mentioned), new Shack additions could be even higher. Many investors point to Shake Shack’s valuation as being too high. At first, we were on the same boat. Relative to earnings (and earnings growth), the firm seemed to be trading much too high for our comfort. Again, we had placed too little weight on adjusted figures provided by management. Management’s goal of 200 company-operated Shacks by 2020 is not far-fetched and will likely be exceeded in our eyes. Management aims to be generating ~$700 million in revenue by 2020. Adjusting for pre-opening costs, operating income would be roughly $140 million. At a $1.55 billion enterprise value (source), the company would be trading at a FY20E EV/EBIT of ~11x. Note that this excludes all licensing revenues from franchises. The high-margin licensing revenues would only lower the forward-looking valuation, increasing Shake Shack’s attractiveness. Now, we don’t expect Shake Shack to stop growing at 200 company-operated Shacks in the U.S. In the long run, we can envision Shake Shack achieving a ~2,000-store count in the U.S. alone. Throwing in licensing revenues, which go almost entirely to Shake Shack’s bottom line, would only increase the attractiveness of the valuation. Given that licensing may be the best approach internationally, the opportunity to significantly contribute to the firm’s bottom line is significant here. It is for this very reason that we have acquired a stake in the business. Could management run into issues with growth? Sure. Could AUV decline much more than expected? Of course. However, in the grand scheme of things, we believe the potential reward greatly outweighs the risk we are taking. Disclosure: I am/we are long SHAK. I wrote this article myself, and it expresses my own opinions. I am not receiving compensation for it (other than from Seeking Alpha). I have no business relationship with any company whose stock is mentioned in this article.